On behalf of the Permanent Secretariat of the Intergovernmental Commission TRACECA let me welcome you on the site of the TRACECA communication portal! We highly appreciate and actively support the interest showed towards TRACECA as we are always open for regional and interregional transport dialogue and cooperation. Guided by the Brussels Declaration of 1993 and the Basic Multilateral Agreement (MLA) signed in 1998 we intend to continue the track of founders and to follow further implementation of the set goals of the TRACECA transport system. 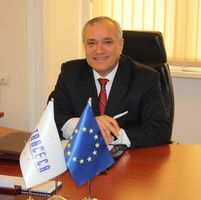 The improvement of transport policy and harmonization of legislation, development of safety systems in the field of road, maritime and air transport in the TRACECA region is far from being a full list of the outlined objectives in respect of creating a sustainable integrated multi-modal transport system at the level of EU-TRACECA and TRACECA-TRACECA. I am confident that joint cooperation in the achievement of common goals, commitment to internationally recognized standards will ensure the constructive solution of current issues and their efficient performance. I believe that our portal will become a convenient instrument of communication and search of information on joint efforts of the EU and TRACECA member states for the support of the development of the Europe-the Caucasus-Asia corridor.